I know, I know, what does that silly dress have to do with Emotions? That is a great question! Well, simply put, the point that came out about "The Dress that Broke the Internet" all boiled down to perception, did it not? 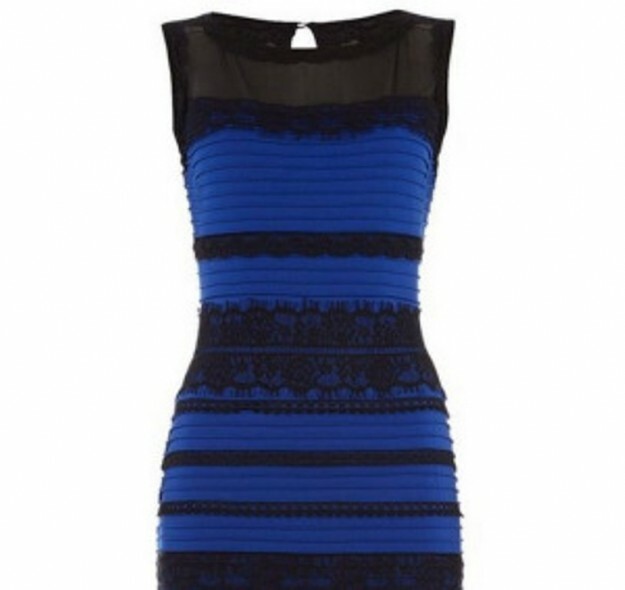 While one person saw the picture as White and Gold others saw it as Blue and Black. This was because of the way our brains have been trained to interpret the colors, in this case in an over-exposed picture. Well, emotions are that way too. Our experiences in life have trained our brains to interpret these emotions a certain way. They mean a certain thing. It has been perfectly caused. Emotions are part of the human experience. While emotions, on their face value are universal, they can carry deeper meaning for people that vary quite a bit. For example, a person crying is a sad person no matter which corner of the globe you live on and no matter what experiences have paved your journey. But what happens when that person stops crying and looks up with a contorted face and asks, "Why?" in an angry tone? Is this person still sad? Are they angry? The person viewing this scenario interprets the actions of the other person based on their own experiences and perception.Then it goes even deeper, what does anger mean to the person asking the question and what does anger mean to the person viewing it? If a person has been physically abused by a loved one because he/she was angry they may very well have a more reactive perception of what anger looks like. While another person who has never been exposed to angry outbursts will have an altogether different perception of what anger means and looks like. I think the point is clear here, we interpret emotions differently and we experience them differently. While they can be similar, there often is a divide. This is especially so with mental illness. How do I regulate my emotions to work for me instead of against me? First of all, we need to become adept at identifying our emotion. What emotion, exactly, is it that I am experiencing? This is a lengthy process, true. But well worth the effort. You will want to know if you are experiencing frustration or anger. Sadness or guilt. Guilt or shame. They have different functions and what we want out of any given situation changes depending on the emotion we are experiencing. How do I know if my emotion is justified? That is the second aspect. First learning to identify the emotion, then learning to determine if the emotion is justified will go a long way in getting what you want...a positive experience. Something to understand, we are taking subjects that are really deeply connected to other subjects and skills. So while I may say how to do something in a simple sentence that was easy to type, it does not mean that it is as simple to do. To be fair, it is not simple to do at all. It takes work and commitment to change. It takes learning how not to judge yourself or others. It takes a deep desire to take a look at your experiences as a detective would a case. The detective goes into a case asking questions with the desire to have an end result of answers and understanding and... solving the case. So is true with your emotions, or any facet of coping with negative experiences in your life. What emotion am I really feeling? Is this emotion is justified? 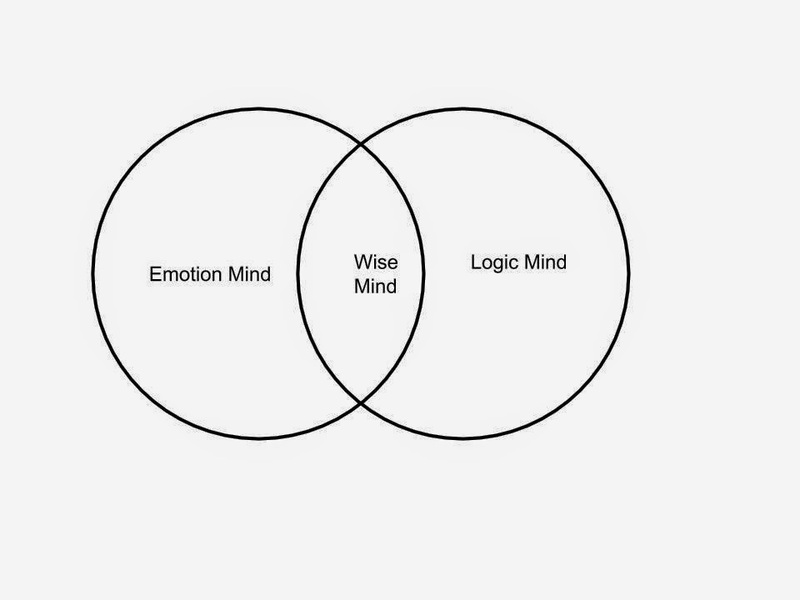 It is quite obvious by looking at that diagram that Wise Mind comes from both Logic and Emotion mind. This tells us that any given situation requires a bit of both logic and emotion to interpret our experiences effectively, or wisely. If the emotion you are experiencing has a base in wise mind, it is a justified emotion. If I were to feel guilty for my childhood abuse, this guilt would not be justified - as it is not emotion from Wise Mind. It is an emotion purely from Emotion Mind, no logic has influenced this emotion. It is not logical that a child can be remotely responsible for abuse they suffer. Logically, we all know this. Emotionally however, this isn't the case. The emotion came strictly from Emotion Mind. Notice though, this understanding of whether the emotion is justified or not does not take the emotion away, the emotion has not been regulated yet. Notice also, I am not bad for the guilt I feel. I am not wrong for this emotion. There is no judgement, it simply means the guilt is unjustified. Knowing the emotion is unjustified now allows me to regulate it properly. For example, if I were to feel guilty because I screamed at the cashier at the grocery store because I was panicking with too many people in the store and the chaos was too overwhelming. Once I calmed down, I would understand that guilt to be justified. A bit of emotion mind tells me, I have a disability and I cannot handle chaos and a bit of logic tells me that the cashier did not deserve to be screamed at. So wise mind tells me that while it is understandable I have a disability, it was unkind for me to scream at the cashier. Guilt (in this case) = justified. That understanding tells me that in order to regulate this guilt I am motivated to action to rectify what I did. Make amends. If I do not move on this action then I will not regulate the guilt, it will sit with me and fester. I will undoubtedly do something else unkind because I cannot return to an emotional even ground with the guilt nagging at me and will feel more guilt until I feel outright shameful for my actions. Do we all see the downward spiral? Shame then causes paralysis in effective living and I have successfully thwarted my progress. On the flip side, if I make amends, the guilt dissipates, I have a positive experience regulating my emotions and I move onto the next. No judgement, no lasting negative consequences. Justified guilt did it's job and I move on. The same is true of the unjustified guilt. In the scenario of unjustified guilt, I need not make amends to regulate the guilt. That would feed the erroneous guilt. However, I still need to be motivated to action to do something to regulate the emotion, so as a detective in my own life I would be curious what methods would help me to understand that I am not guilty of anything relating to abuse as a child. I would ask questions and be curious as to what I could do to change this thinking error. Of course, again, that would lead us down a path of self-healing that is well worth the effort but cannot be summed up in a paragraph or two here. The point is valid though. As was with the dress mentioned on the outset. While the interpretation of the colors was different between people, the actual color or "justified" color was in fact, blue and black. Depending whether we saw it justified or unjustified it would make a difference as to how we would proceed if we wanted to purchase it. The unjustified viewing would mean that I would have to change my color scheme because the dress doesn't come in gold and white, the justified viewing would mean I could move forward on ordering the dress. The action is different based on whether my interpretation was justified or not. Give a try at identifying a particular emotion. If the emotion is found to be affecting you negatively - try using the skill Opposite to Current Emotion. This is where you feed the distressing emotion with it's opposite, sad:happy, frustrated:uplifting, anger:joy, etc. This can be done in moments of the distressing emotion, some examples given at group were watching a funny YouTube video or viewing cute kitten pics on Google+ or Facebook. If you are finding yourself in a particularly distressing situation maybe something longer, like a full feature length Comedy movie on Netflix. Or a trip to a quite library or park. Play with it this week and get a feel for what might feel is right for you. As always we enjoy hearing what works and what doesn't from anyone who is brave enough to share! Thanks for reading and happy day!